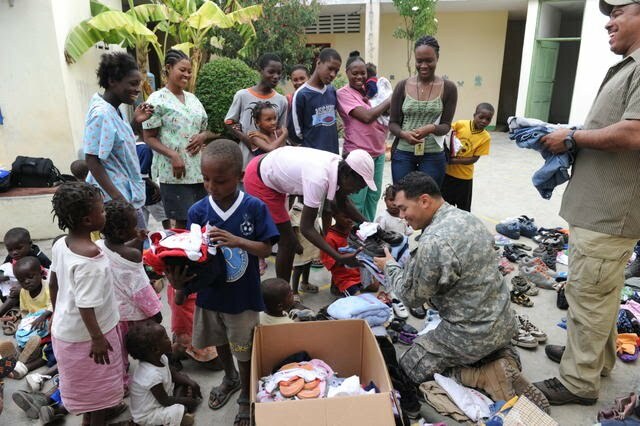 When I asked Lieutenant General Ken Keen, Commander Joint Task Force Haiti, what he would leave behind in Haiti he said, “the smiles of the Haitian children”! General Keen gave me a wonderful glimpse of his experiences and those of 22,000 other American service members serving in Haiti following the earthquake on January 12th in an exclusive MilitaryAvenue, Our Letters to You, interview this morning. The general felt strongly about sharing this story with me! He wants our military families and other Americans to know what we did in Haiti and how successful our Soldiers, Airmen, Coasties, Sailors and Marines have been while saving lives and alleviating the unimaginable pain of an entire nation! General Keen was in Haiti when the earthquake occurred on January 12th. He was meeting with Ambassador Kenneth Merten at his residence as they witnessed the earthquake and its impact on the Haitian capital of Port-au-Prince. The general vividly described the residence, where he was sitting and how they immediately realized that thousands of lives had been l ost. They felt the earthquake, saw the dust rising from the collapsed buildings and heard the screams of the injured. Able to maintain communications with Southern Command they responded to an immediate call for assistance from Haitian government envoys. The ambassador and general were able to tell them that the US President and country would provide our full and maximum support to alleviate the results of this huge disaster! The message: One of hope for the Haitians traumatized by this catastrophe! According to General Keen, the Haitian president and ministers first asked for assistance getting the airport operating again since that would be the lifeline of the initial humanitarian assistance. The tower had collapsed and status of the one runway and taxiway were unknown. General Keen drove to the field the next morning and requested Air Force special operations airmen from Hurlburt Field to re-open the airport. This was a critical first step to get the aid flowing into Haiti and they arrived within 28 hours of the earthquake. With their assessment complete and portable tower facility in place they pushed 125 flights onto the airfield on the second day! I’d call that maximum support! While the Air Force responded with airfield support, the Coast Guard turned cutters toward Haiti and began helicopter operations with medevacs in the immediate aftermath of the quake. Anxious to get the seaports open as the long term logistics lines would flow through there, Navy teams were dispatched to assess the situation for the government. With their initial assessment showing significant damage, Joint Task Force Haiti then requested barges to allow offloading of ships in the port to be transferred to the shore. The response was beginning to build and the new Collaborate and Coordinate (C2) theme began for the leadership. I asked General Keen, why the new term for C2? Military C2 is traditionally, Command and Control and had become Coordination and Collaboration in the JTF. He responded that we were a supporting force and the United Nations forces (8,000 on the island), Haitian government resources, numerous non governmental organizations (NGOs) and other international responders needed a singular focus and purpose – Save Lives! Unity of purpose allowed all to recognize the need to respond with the best solution. NGOs food distribution centers were assisted by the 82nd Airborne soldiers and no food riots occurred despite a population desperate for food and water. While they could be hungry and thirsty no one died of starvation or thirst due to these efforts! New ties with NGOs that recognized the humaneness of soldiers supporting them are a by product of the 82nd efforts. The general felt that experiences in Iraq and Afghanistan allowed soldiers to communicate with the people, community leaders and paid great dividends. The information cell developed to coordinate strategic communications was also critical to the response with multiple agencies from the US government, the UN, Haiti government and NGOs participating. Recognizing that communications about their efforts were important, the general’s team of commanders and other leadership participated in numerous DoD Blogger Roundtables in addition to more traditional media efforts to tell the story. On February 1st the US military response to the disaster reached its peak with 22,000 personnel, 58 aircraft and 15 ships directly involved. This does not include all the Transportation Command aircraft and personnel supporting the effort from the US mainland and locations such as Guantanamo Bay Naval Base in Cuba with its easy reach to Haiti. The medical response saved countless lives with the Navy’s USNS Comfort receiving critically injured patients before they even reached port! As of 1 April the military caregivers had treated 19,000 + patients, admitted 1,200 patients to military facilities, completed 1,025 surgeries on critical patients and completed 255 medevac missions. I know of at least one baby delivered on board the Comfort following a medevac as well! When I asked about units that had the biggest impact he named off numerous organizations involved but I could tell he was concerned about not leaving one out! All US military personnel were received with open arms by the Haitian people and of course the medical response for those injured was critical to the lifesaving efforts of all. He named the 2nd BCT of the 82nd Airborne Division, the 22nd and 24th Marine Expedition Units (Bataan and Nassau), the aircraft carrier Carl Vinson, the special operations forces from Special Operations Command South with their civil affairs teams, the USNS Comfort hospital ship and of course the initial responders from Hurlburt Field! To give you some idea of the effort and what was accomplished by the JTF and supporting commands in the US the JTF provided me these statistics. Service members provided 4.9 million meals, 17 million pounds of bulk food and 4.2 million bottles of water to the Haitians! As of April 1st, there have been 4,600 JTF-Haiti aircraft sorties flown, they supported the distribution of Emergency Shelter for 1.3 million displaced persons; distributed 174,000 tarpaulins and 29,000 tents. The engineers trained over 200 Haitian building inspectors and conducted 14,000 structure assessments; upwards of 45% of all structures inspected marked as "safe to occupy." Finally, 32,000 cubic yards of rubble was removed from the streets of Port-Au-Prince. What of the future? The JTF will be closing eventually (June 1st?) and the needs of the Haitian people have not lessened! He said the capacity of the NGOs, United Nations and Haitian government was tremendous but that funding and the execution of the Haitian government’s development plan were key to the recovery which could take a decade to complete. He also said that the US military ties will continue with support from US Southern Command. I queried the general on what he would leave behind in Haiti when the Task Force closes with its mission complete. First, he said he was very proud of how we responded, from the President, to the JTF and to every single soldier, sailor, guardsmen, airmen and marine involved in any way! No one could leave Haiti with out being touched by the resilience of the Haitian people. His regret? The job is not over! Forever imprinted? The smiles of the Haitian children! Thank you General Keen! What a marvelous team you lead and we are so appreciative of your efforts and for taking the time to do this interview! If you would like to see other blogs written about Haiti in MilitaryAvenue.com's Our Letters to You, please go to this Haiti link which will pull up the blogs chronologically from the last to the first of the series.